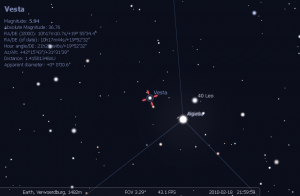 Last night, following a tip from SkyandTelescope.com, I pointed my binoculars to Gamma Leonis and found Vesta, the second largest asteroid in our solar system. 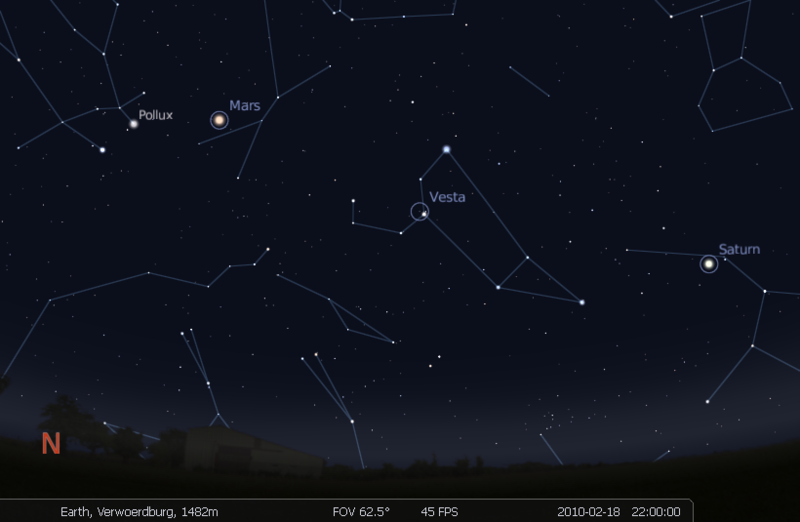 Vesta is currently so bright, that under dark enough skies it can be seen with the naked eye. 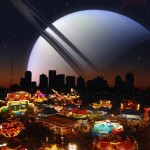 In the city, though, binoculars or a telescope are required. 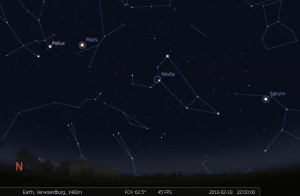 If you’re keen, you can join me watching it move from night to night by following the diagrams below, which were generated in Stellarium. Note that these directions are written from the point of view of my home in Pretoria. Start by finding Mars. Go outside at about 10pm, and face North. If you don’t have a clear view of the Northern part of the sky, move till you find somewhere that does! Mars appears about halfway up the sky (although this is a well-studied optical illusion – it’s actually more like a third of the way up!) as a bright, distinctly reddish-orange star. It is very hard to miss. If you’re uncertain, look at it through your binoculars. 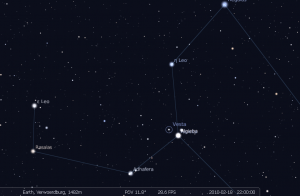 It should immediately look different to the other stars – bright, steady, colourful, and visible as a tiny disc (normal stars will still look like points). 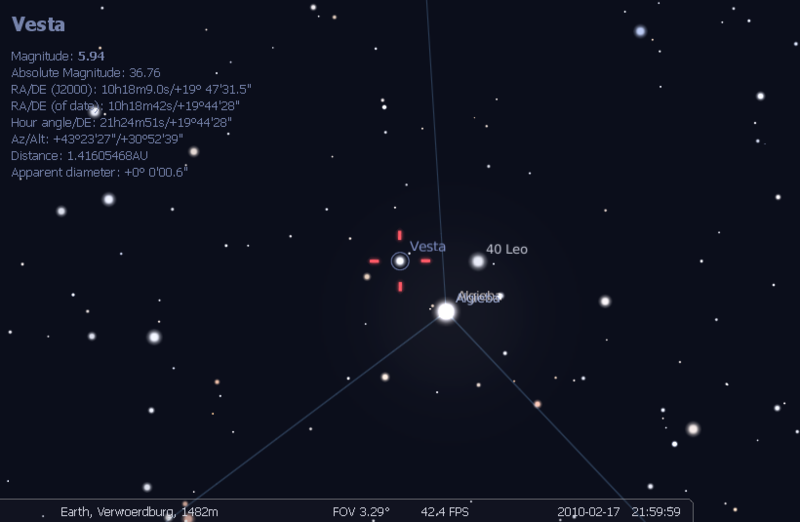 Once you have Mars, scan towards the right until you find the constellation Leo (The Lion). Leo has a distinctive sickle shape, representing the lion’s head. 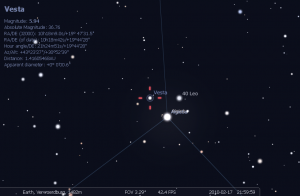 Most of the surrounding constellations are quite faint, so Leo should not be hard to find. 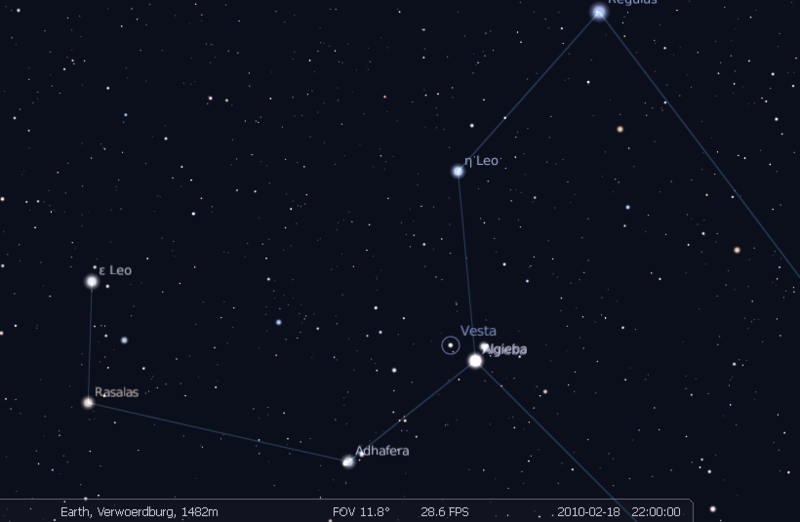 Algieba and it’s companion normally appear as two stars. 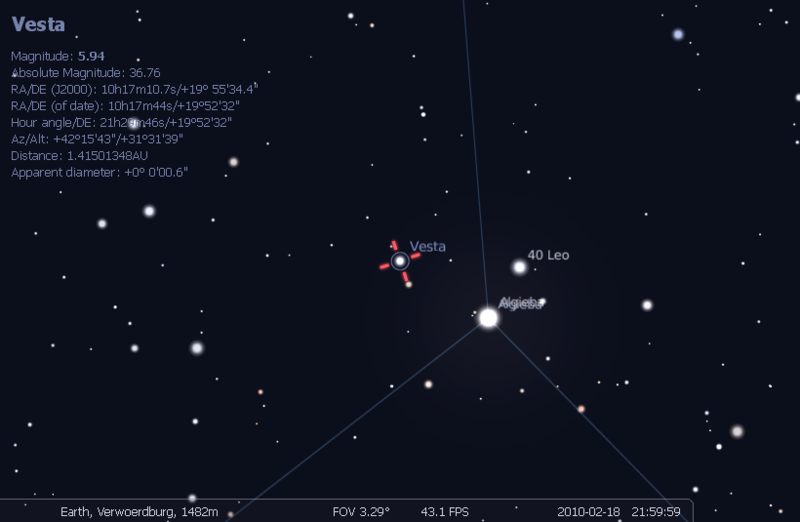 However, Vesta shows up as a third, so that they form a triangle, as seen below. 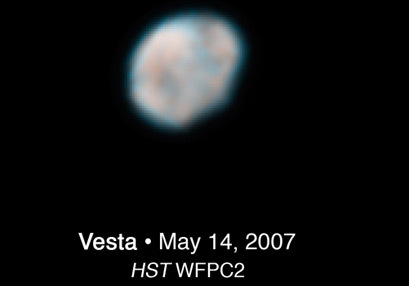 By observing from night to night, you will see Vesta moving. This, in fact, was how asteroids were first discovered – as stars which seemed to move amongst their neighbours so rapidly that the change could be seen from day to day! Below, I show the views from last night and tonight (17 and 18 February, both at 10:00 pm). These charts represent approximately the view as seen through my 10×50 binoculars.